Most of us know oral hygiene can play a critical role in a person’s overall health, but did you know the same applies for your furry friends? Humans schedule regular dental cleanings to keep their gums and teeth healthy, but dental health in dogs and cats may be overlooked by pet owners. In addition to homecare, pet owners can arrange for their pet to have an annual teeth cleaning under anesthesia at their local veterinary clinic. Veterinarian prescribed dental diets, proper dental chew toys, and drinking water additives—products that can be mixed into pet drinking water to help control bacteria level and plaque in the mouth—may also assist in preventing dental hygiene issues. However, if your pet has persistent bad breath, experiences bleeding from the mouth or tooth, a change in eating behavior, and sensitivity to touch around the mouth, it may be a sign of a more serious dental health condition. Dental therapy for more serious health conditions include many of the same procedures that help humans maintain healthy teeth, gums, and mouths. Available treatments include oral surgery, periodontics, endodontics, restorations, and even orthodontics. Some of these procedures may be offered by your family veterinarian or you may be referred to a board certified veterinary dentist. It is important for pet owners to recognize the connection between healthy teeth and their animal’s overall health. When you make a dental appointment for yourself, it might be a good idea to make a veterinary appointment to have your pet’s teeth cleaned as well. Proper dental hygiene help promote a longer, healthier life for your pet. Pets are more than just our companions — they are a part of the family. As your pet ages, it is important to consult your veterinarian for help providing the proper care for your senior pet’s changing needs. Every animal is different, so the senior life stage occurs at different ages in different pets. For instance, dogs are typically considered seniors at seven years old, but older dogs age more quickly than smaller dogs. Cats can be considered mature at 7 years and seniors at 11 years old. Breed and species aside, your pet’s genetics, nutrition, health and environment will ultimately determine when your pet is considered a senior. In addition to a decrease in physical activity, older cats and dogs tend to develop more degenerative health problems. “Chronic degenerative disorders like heart and kidney disease are common in older pets, and so is cancer,” Eckman said. “In cats, kidney, heart and thyroid disease are the most common aging conditions. In dogs, different breeds are more prone to certain conditions. For example, some breeds are more likely to see a dramatic increase in cancers as they age.” A visit to the veterinarian every six months can help determine what is normal for your pet so that any changes in behavior or health can be detected early. As much as we would love our pets to live forever, they grow old and need special care. To ensure your pet lives a long, healthy life, be sure to visit your veterinarian regularly to discuss your pet’s diet, exercise habits and overall health. Our family has always had pets and each is a valued member of the family. Our painted turtle, Myrtle, is over 30 years old. She was my husband, Joel’s, birthday gift when he was 15 years old and has made multiple moves over state lines with him, and eventually with both of us and our twochildren. We also have given a home to three gerbils, a dozen Koi fish, and two dogs. But it wasn’t until after our daughter, Charlotte, died at Sandy Hook Elementary School on December 14, 2012, that we realized the full impact dogs can have on our well being. Charlotte was an avid dog lover. 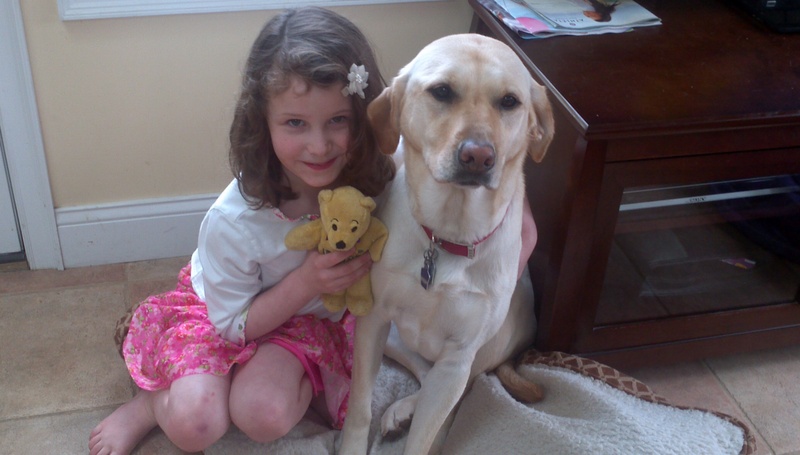 When we rescued our yellow Labrador, Lily, Charlotte was three years old. Charlotte accompanied Lily on her first veterinary visit, and quickly decided that she would be a doggy doctor when she grew up. Charlotte spent her playtime with Lily or playing with her stuffed dogs. Loving dogs was one of her defining characteristics. In the months following her death, Joel and I searched for the perfect way to honor Charlotte. We settled on focusing on the thing she loved second to only her family, dogs. With the help of award-winning author Renata Bowers, we wrote the children’s book Good Dogs, Great Listeners: The Story of Charlotte, Lily and the Litter. The book focuses on Charlotte’s relationship with her constant companions, Lily and her litter of stuffed dogs. The details and adventures are authentically Charlotte and beautifully illustrate the strong bond between Charlotte and Lily. As we were working on publishing Charlotte’s story, another story was beginning to write itself and it involved our son, Guy. This story also included dogs. After watching the powerful impact these dogs had on Guy and to honor Charlotte’s biggest passion, Joel and I decided to advocate for the use of therapy dogs in all schools. We founded the Charlotte’s Litter program to bring awareness to benefits of therapy dogs in schools with the hopes that more schools and districts will adopt a therapy dog program of their own. We have seen steady interest from schools that would like to introduce therapy dogs, and our next concern is advocating for and supporting the training of more therapy dogs teams to meet the demand. Our family has suffered a tremendous loss and we continue to grieve each day. We were fully aware of the joy and comfort a family dog brings to a home, but had never considered the impact that working therapy dogs would have on our family. Most of these therapy dogs are just regular pets who like to sleep, cuddle, play catch, and perform tricks for treats in their leisure time, but when it is time to work they commit to giving fully to the human they are helping. It is a demanding job, but these dogs demand nothing in return. That is dedication to the highest degree. Like humans, pets can become obese and develop excess body fat, which can lead to serious health problems, such as diabetes or degenerative joint disease. In order to provide your furry best friend with the highest quality of life and increase their life span, be sure to follow these simple steps to prevent your pet from becoming obese. Weight gain in pets is often a result of overfeeding and lack of exercise. To keep your pet at a healthy weight, be sure to provide a healthy balance between food intake and physical activity. For example, give your dog or cat two to three meals a day instead of providing food at all times, and make sure to include at least one daily walk or some playtime. Maintaining a healthy weight for dogs and cats also depends on the type of food they eat on a daily basis. Owners should choose an appropriate pet food according to the animal’s age, weight, and activity level. Generally, younger dogs and cats need to consume more calories per pound of body weight than older dogs and cats. Animals with active lifestyles and pregnant or nursing females require more protein, minerals, and calories in their diet. In addition to diet and exercise, pet owners can regularly monitor their pet’s weight by routinely weighing them around the same time of the day. This can be effective in catching your pet’s weight increase before it becomes a more serious problem. Obesity can also be caused by some serious health problems rather than simply reflecting poor diet and lack of exercise. Weight gain can be related to hormone problems, such as hypothyroidism in dogs and acromegaly in cats, which is defined as excess growth hormone production. Dogs with hypothyroidism gain weight without eating more food than usual, while cats with acromegaly will experience an increase in appetite. Dogs and cats with Cushing’s syndrome will appear as if they’ve gained weight with their pot-bellied appearance, but these patients rarely experience a weight increase. No matter the cause of obesity in dogs and cats, severe secondary diseases and health problems can develop if the obese patient is left untreated. There is good evidence that obesity impacts quality of life as well as life span. “In dogs, obesity is often associated with joint problems, such as arthritis and loss of mobility,” Cook said. “Obesity in cats is strongly associated with diabetes mellitus.” In addition to these health conditions, an obese pet may also have difficulty breathing, become fatigued with routine exercise, and be unable to groom itself effectively. Though it may be tempting to spoil your pet with table scraps and extra servings of food, consider thinking twice about the consequences your pet may face as a result. To provide your pet with a healthy and happy life, consult your veterinarian in keeping a balanced lifestyle and choosing the right food for your pet’s needs.